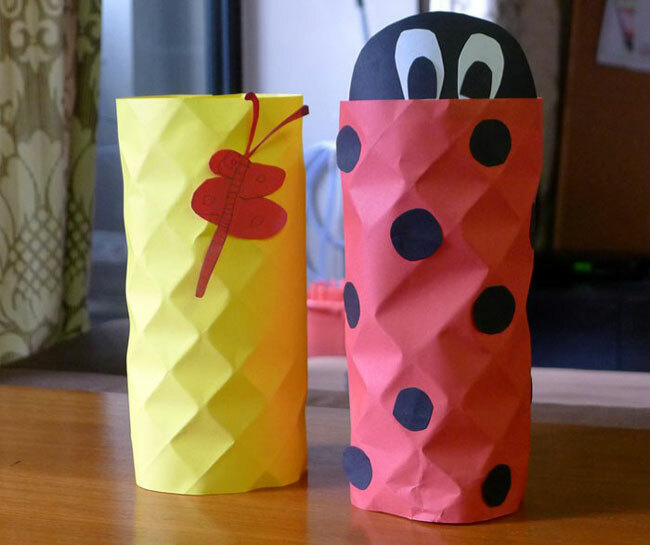 5 Lanterns You Can DIY for the Mid-Autumn Festival! As the Mid-Autumn Festival nears, we get excited about basking under the moonlight while savouring mooncakes with family and friends. Another symbolic tradition we still practice today is walking around with beautiful lanterns! Here are five lanterns you can DIY while spending precious quality time as a family. Body of the lantern: Make diagonal folds on an A4 coloured paper, starting one corner and working your way to the end. Unfold and do the same thing to the opposite corner. This way, you can achiever regular diamond shapes throughout the paper. Roll up the paper and fasten the ends with double-sided tape. This will be the body of the lantern. Base of the lantern: On the piece of cardboard, trace the circumference of the rolled-up paper. Draw four rectangles outside of the circle and cut it out. (This will be the base of your lantern and the rectangles make it easier as they will be glued to the inner sides of the paper.) Use double-sided tape to attach the cardboard base to the body. Handle of the lantern: Poke two holes at the top of the body – opposite each other. Stick a tape just above the holes to prevent tearing. Insert the string and tie the ends of it to the end of a chopstick. Use glue to secure. This becomes the handle of the lantern. Use some glue to attach the candle to the base of the lantern. Tip: due to the long body of the lantern, it is better to light the candle with another lighted candle instead of a lighter. 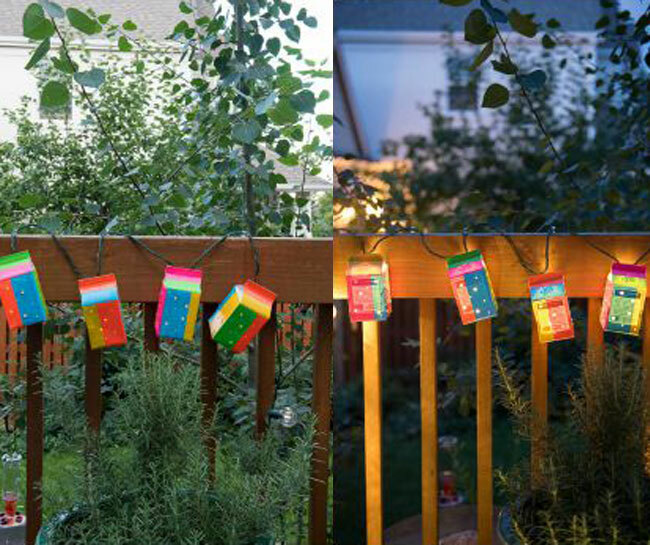 Tip: Use any of your child’s old artwork to decorate the lantern, and voila! You’re done. 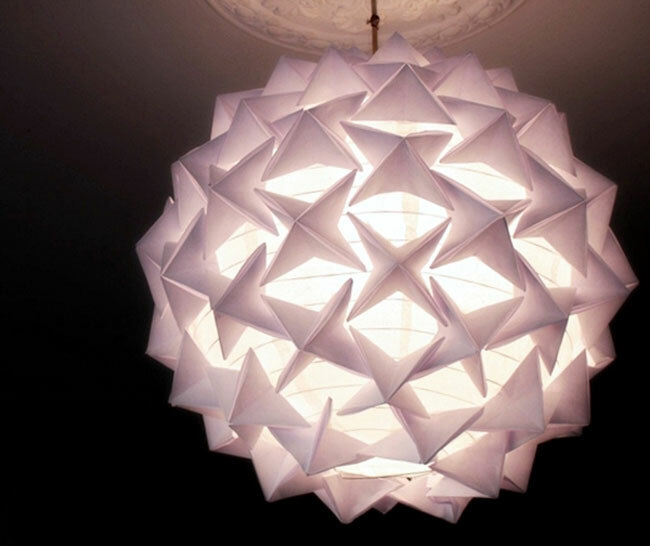 Body of the lantern: Roll up one piece of paper and fasten the ends with double-sided tape. Fold another piece of paper into half. Sketch lines (with a pencil and ruler) perpendicular to the folded end, leaving about an inch from the other end of the paper. Use scissors to cut through the lines and this will coat the body of the lantern. Unfold and attach to the rolled-up paper using double-sided tape. 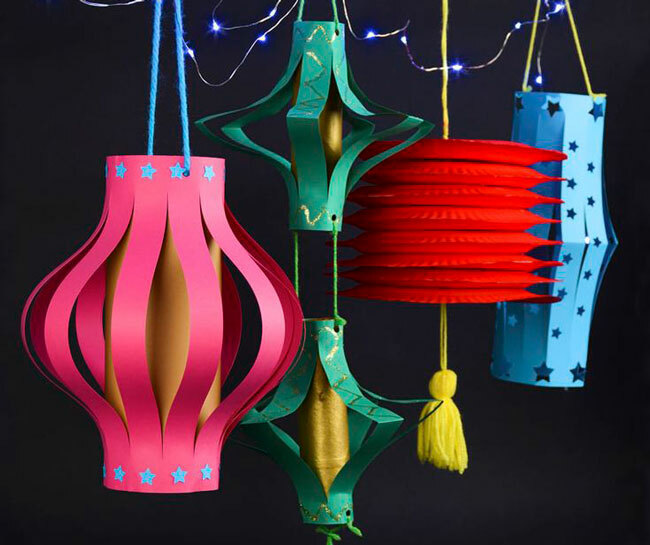 Depending on how short or tall you want your lantern to be (and how puffy the exterior should look like), trim off excess paper from the body. Base of the lantern: Trace the circumference of the rolled-up paper on a piece of cardboard. Cut it out and attach to one end of the body. Handle of the lantern: Cut a strip of paper and paste it at the top of the body. Using glue, attach a candle to the base, and you are done. You can also add various different cut out designs like stars or use a glitter pen to make your lantern even more unique! Body of the lantern: Using a pencil and ruler, sketch rectangles of varying heights on the carton and using a penknife, cut the rectangles out. Use duct tape to cover the holes. Remember to use different colours for the best effect. Poke holes on the body for light to escape through. Handle of the lantern: Poke two holes at the top diagonal surface of the carton and insert a string through it. Wound the string around an end of a chopstick and use glue to secure. Using the glue, carefully stick the stars to the outside of the paper lantern. Tip: Prior planning is important! Attach the candle to the base of the paper lantern and you are done! Body of the lantern: Print out template on the coloured paper from here. Cut out the template. Using glue, attach the little tab at the far end to the other end, sticking it on the inner surface. Handle of the lantern: Poke a hole on the round surface of the tip of the template for the string to run through. Wind the string to the end of a chopstick. Decorate your lantern by drawing or painting on the lantern. Mission accomplished!